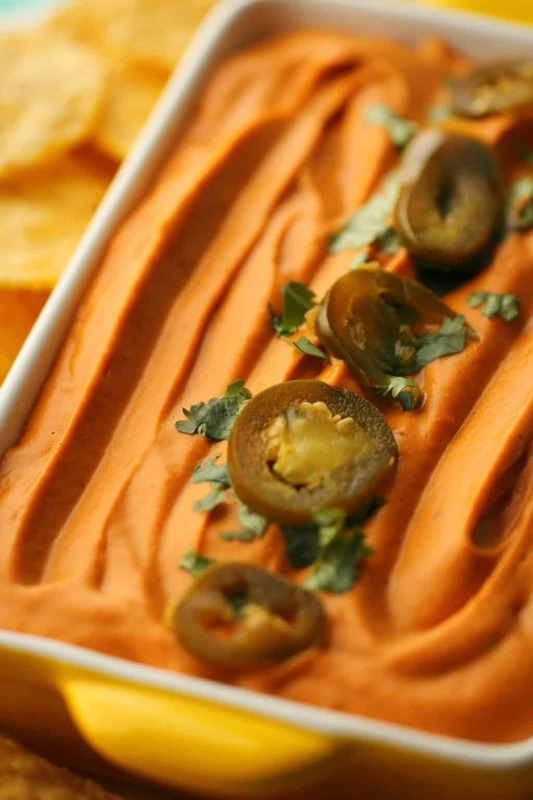 This vegan queso is so cheesy your friends won’t believe it’s vegan! 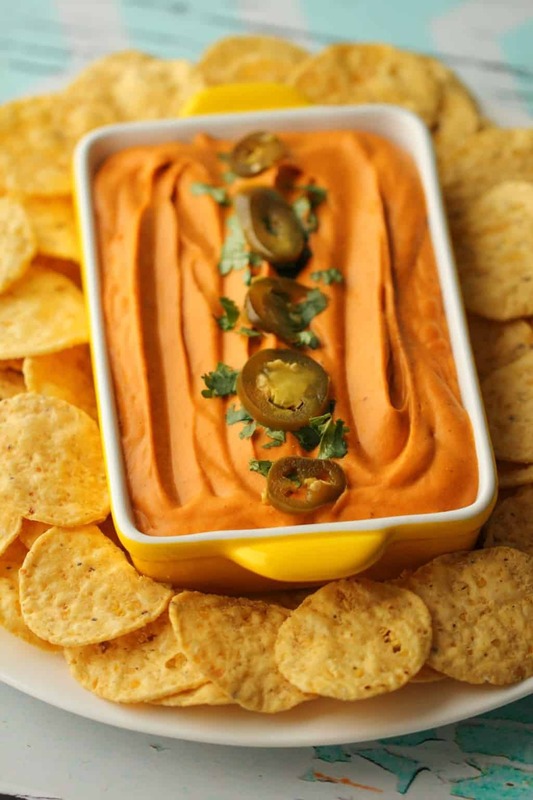 It’s also ready in 30 minutes and served with loads of corn chips for dipping will make you the snack queen. We start off sautéeing some onion and garlic in olive oil and then add some potato and carrot (seriously, these are amazing for cheesy texture!) and a jalapeño chili and some spices and cook it all up in some vegetable stock. When that’s all cooked you add it to the blender with some cashews, sundried tomatoes, nutritional yeast, hot sauce, and salt and pepper! And that’s it really! 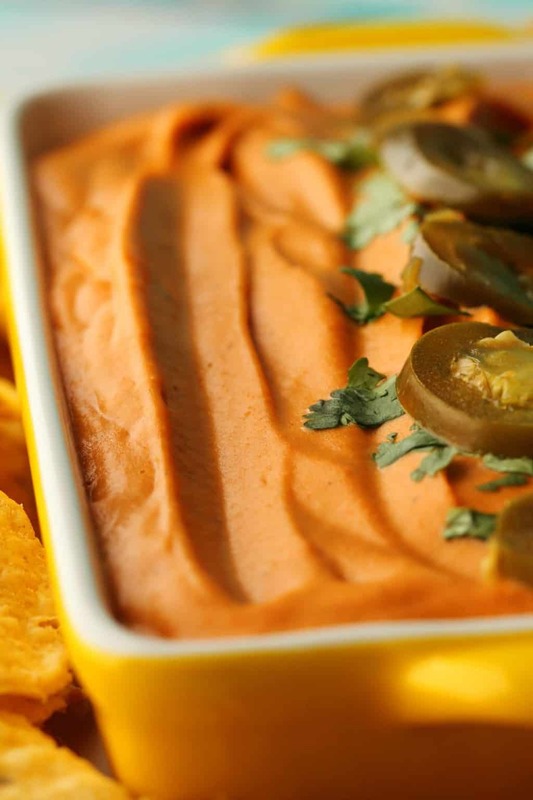 Serve it with some sliced pickled jalapeños and fresh cilantro and of course, lots of corn chips and you’re the bees knees. 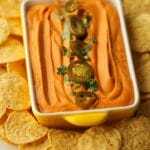 The sundried tomatoes create a deliciously rich flavor that contrasts so well with the cheesiness and there’s just enough spiciness in there to create a nice little mouth buzz but nothing extreme. 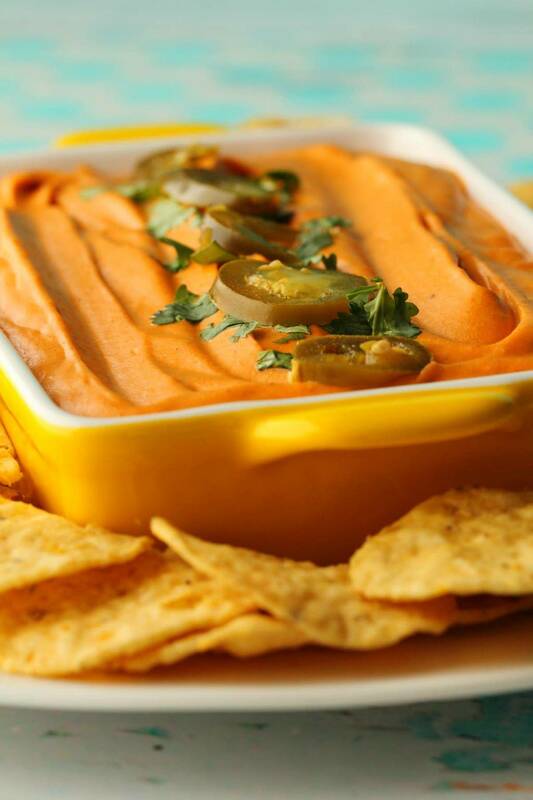 This vegan queso has more uses than just a dip! 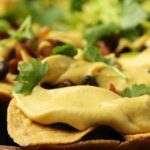 It is of course also great over some vegan nachos, with fries, on vegetables (hello cheese sauce for broccoli! ), or heck use it as a pasta sauce if you like! 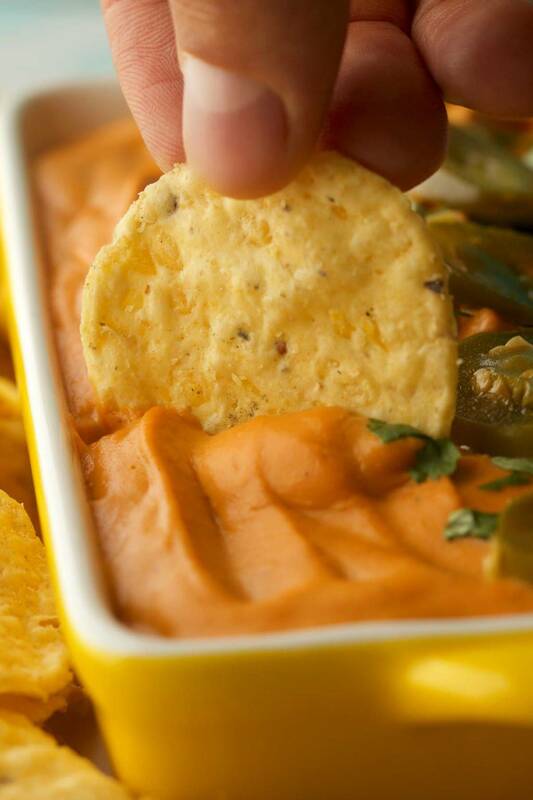 But as a simple dip for some corn/tortilla chips, it can’t be beat. 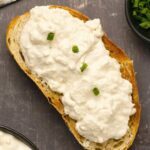 It makes the perfect dip and will easily serve 4-6 people. Keep leftovers covered in the fridge and either enjoy cold or reheat as you prefer! 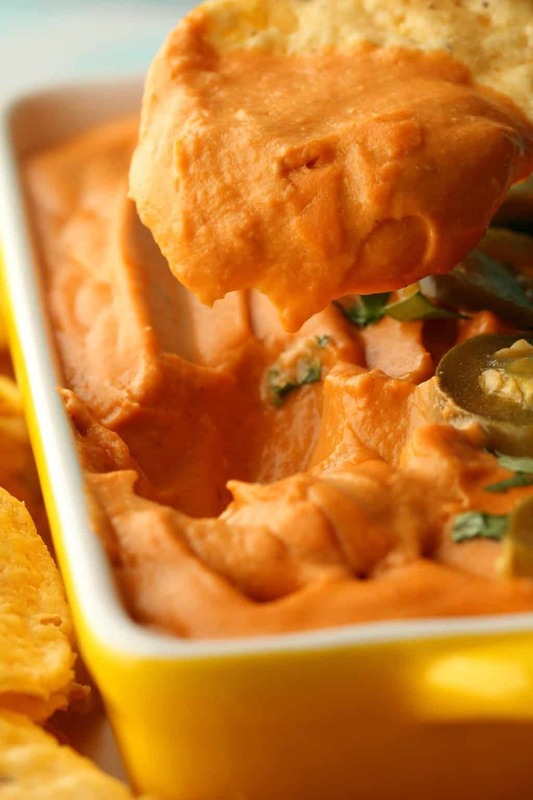 So what do you think of this vegan queso? Let us know in the comments and please rate the recipe too! Sign up to our email list for a fabulous ebook containing 10 dinner recipes (absolutely free!) 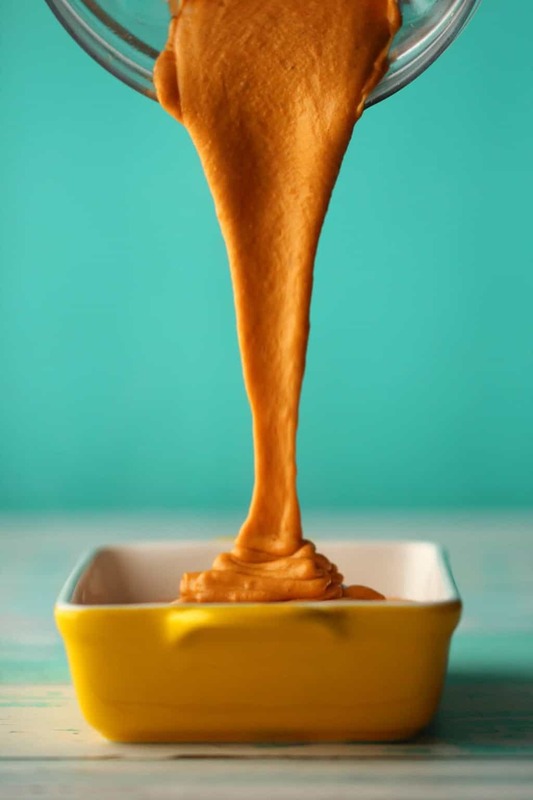 and to stay updated with all our latest recipes posted to the blog. 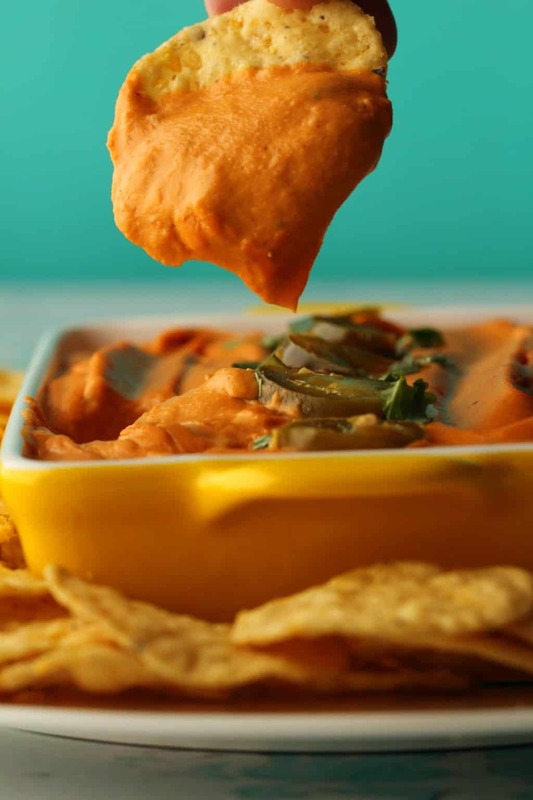 Rich, velvety and ultra cheesy vegan queso. 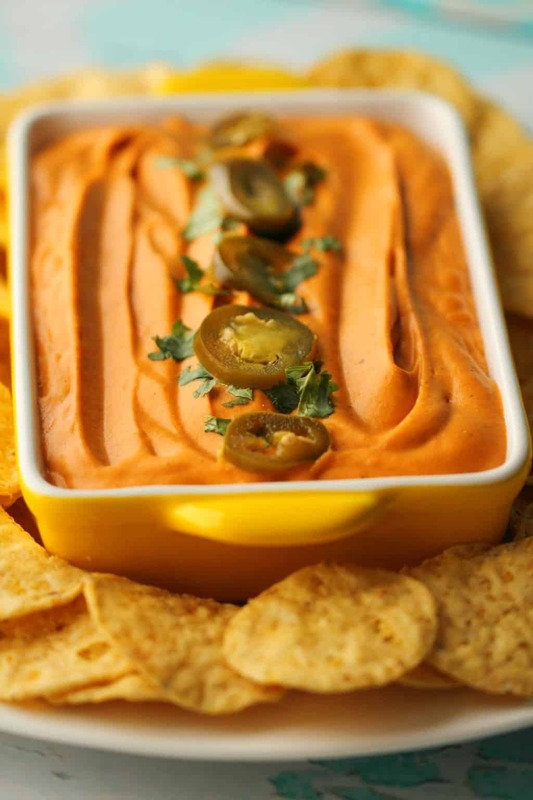 Perfectly spicy, smooth and creamy this quick and easy queso makes the perfect dip for some tortilla chips! Add the olive oil to a pot with the chopped onions and crushed garlic and sauté until softened. Then add the potato, carrot, jalapeño, cumin, paprika and cayenne pepper and sauté to mix in the spices. Add in the vegetable stock and bring to the boil. 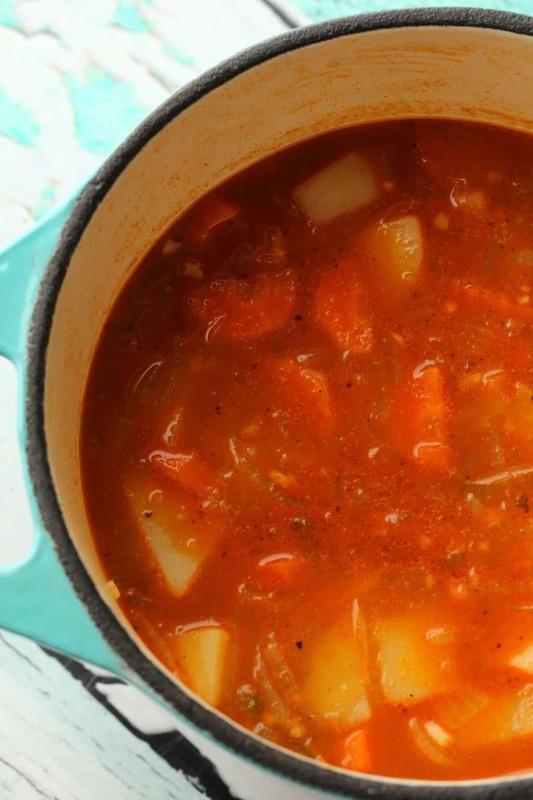 Turn down the heat and let it simmer until the vegetables are soft and cooked. Add the cooked veggie mix to the blender with the cashews, sundried tomatoes, nutritional yeast, hot sauce, sea salt and black pepper. 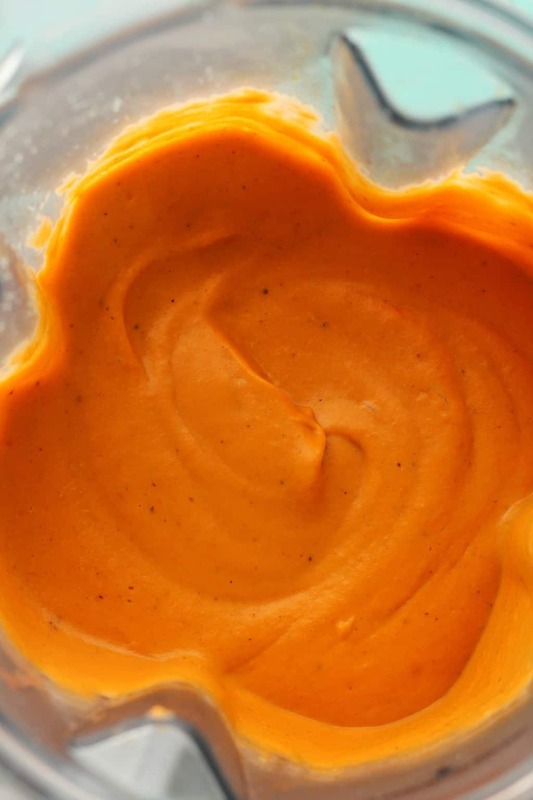 Blend until smooth and cheesy. 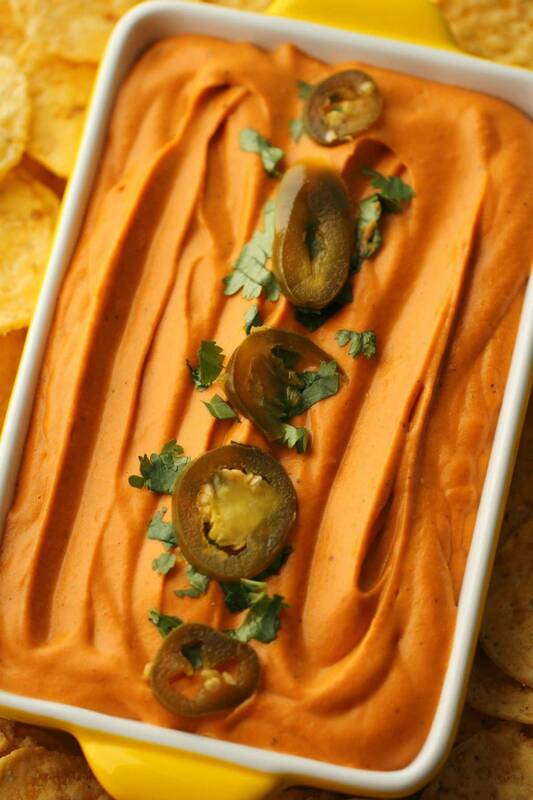 Pour into a serving dish and top with sliced pickled jalapeños and fresh chopped cilantro. 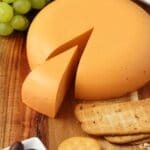 *If you want a thinner cheese consistency you can add in a little coconut milk when blending (up to a quarter cup (60ml)) to thin it out a bit more. 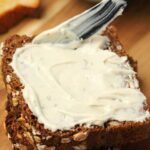 Previous Post: « Vegan Chocolate Zucchini Cake – Fudgy and Moist!